There are several universal job search tips, like: proofread your resume, arrive early--but not too early, know your resume inside and out … and the list goes on. Universal tips are great, but what about landing a job in a specific industry? What works for a healthcare job candidate could greatly differ from what lands you a job in finance and accounting. 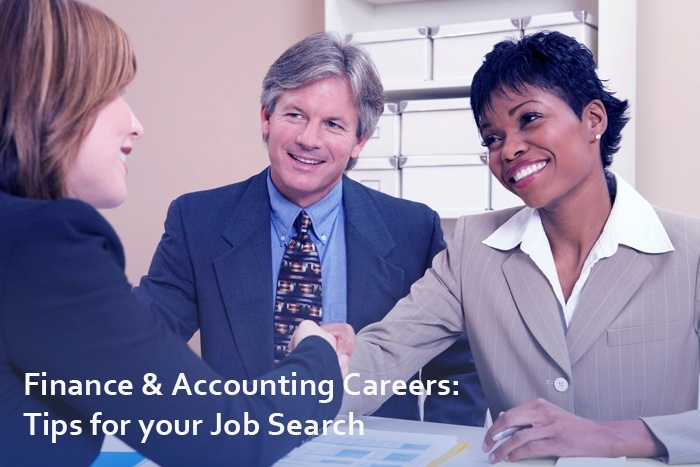 Let’s discuss a few tips on how to find success in your finance and accounting job search. Successful finance/accounting resumes are a lot like business suits, the best are tailor-made for a good fit. You’ll achieve more success when you tailor your resume to a position’s specific requirements. Your resume should quickly highlight the qualities and qualifications that make you right for the job. Make your resume stand out in applicant tracking systems and to a recruiter’s eye by enhancing your professional profile with applicable keywords culled from the job description. Also, finance and accounting positions require a great deal of trust. Highlight your professional and academic certifications and credentials to demonstrate your credibility. Take a look at tips from Monster.com for more on finance and accounting resumes. Join professional associations or networking groups. If you’re just getting started or established in your field, professional associations are a great way to get in touch with a group of like-minded professionals. These groups often have monthly or quarterly meetings that provide ample opportunity to meet industry leaders, seasoned pros, and colleagues with similar goals. As an added benefit, associations often offer educational programs and certifications. Not sure where to start? Take a look at this list of finance and accounting associations and networking groups. Leverage your education with alumni networking. Higher education is expensive; why not get the most out of it?! Attend alumni events to establish genuine connections with established professionals, find potential mentors, and possibly find a door into your dream company. A shared educational experience is a great foundation on which to build a professional relationship. Follow Up Online. It is important to make connections in the real world, and it is equally important to maintain them. Don’t wait until the next alumni gathering or association meeting to make contact. Reach out via LinkedIn or follow new colleagues on Twitter. Alumni groups and associations often have message boards or LinkedIn groups, so join the daily conversation to remain social and stay informed. Finance & Accounting Interviews: What to Wear, What to Know? What do I wear? According to Pamela Holland, coauthor of Help! Was That A Career Limiting Move?, “nothing is more precise and exact than managing money, you cannot afford to have a hair out of place. Full business professional attire is required and expected.” (Monster.com). In other words, be sure to wear a well-fitted dark suit. Even if you’re applying for a position in a more relaxed industry, the finance and accounting functions tend to remain more traditional and a candidate should dress accordingly. For more tips take a look at this article. While it is specific to investment banking, the rules can also apply across finance and accounting. How do I prepare? The best way to prepare for an interview is to know the job requirements, know your resume, and know how they complement each other. You’ll also want to know about the company. You’ll most likely be asked why you’d want to work for that institution, so knowledge of the company and how it works is important. If you are given a specific name, it is also good practice to learn a little bit about your interviewer. A quick Google search, the company’s “about us” page, and LinkedIn can give you valuable insight. You should be knowledgeable on current events in finance. Being well informed on recent news will demonstrate your passion and show that you are aware of changes in the industry. Finally, prepare questions on the areas above because you will most likely be asked if you have any questions for the interviewer. Landing a job in finance and accounting requires unique tools and skills. Advanced Resources’ Finance Division specializes in placing top financial and accounting professionals with companies throughout the Chicagoland area. If you are looking to make a change or begin your career, let Advanced Resources’ Finance Division be your guide! To learn more visit https://www.advancedresources.com/accounting-finance/.